Today is the anniversary of the death of my great great great grandfather Alfred Henry William Gallienne. This ancestor has been quite tricky to trace. For many years he was known to me as Alfred W. Gallienne, as I thought Alfred H. Gallienne was a different person with a different wife. 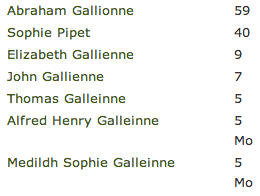 But recently during my visit to Guernsey in July 2013, I made a few break throughs with my Gallienne family tree and discovered that they were one and the same person. These things take time to clarify and you don’t want to add things to your tree that are incorrect, especially on a place like Ancestry.com where incorrect details are often shared or passed on. A spontaneous visit to the Priaulx Library resulted in my mother and myself finding Alfred’s death in the local paper, as you can see in the photo below. A visit to the Priaulx Library is a ‘must do’ on your list of things to visit when in Guernsey on a family tree hunt. Not just purely for the records but because the building inside is a wonderful step back in time and everyone there is so helpful. 1841 – Alfred H. W. Gallienne and his twin sister Matildh Sophie were born sometime in 1841 in Catel, Guernsey. Possibly the son of Sophie Pipet. 1851 – Alfred, age 10, is now living at The Catel, Guernsey, where he is listed as an ‘inmate’ along with Nicholas Gallienne, aged 66, John Gallienne, aged 16 and Thomas, aged 14. The Catel was once a poorhouse and hospital. 1871 – Alfred, aged 30, is aboard the ship “FASHION’ – rank: able seaman. His wife Louisa is in the 1871 census at home with her father Thomas Brehaut and their sons: Alfred and Albert. 1881 – Alfred, aged 40, is head of household and is living with Louisa his wife, now a CHARWOMAN and their sons Alfred, Albert and daughter Louisa. He is recorded as working as an Agricultural Labourer. 1884 – Alfred’s wife Louisa dies at the age of 43, reason unknown. 1891 – Alfred, aged 50, is now living in Planque, Guernsey, with his new wife Rosalie Brehaut. Is this a sister of his first wife Louisa Brehaut. It is possible as this was common practice in those days. Living with Alfred and Rosalie are their sons Alfred (22), Albert (21), daughter Louisa (20), and Edwin (8) and John (4). 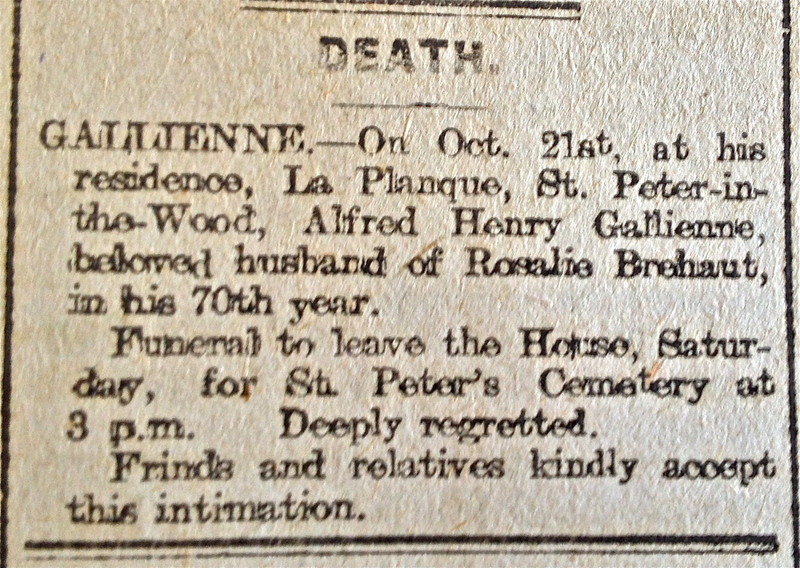 1901 – Alfred, aged 60, is still living in Planque, with Rosalie, Edwin Brehaut (stepson), John (14) and Alice (8). 1911 – Alfred, aged 70, is living at La Planque, with his wife Rosalie, daughter Alice Mary (18) and is working as a general farm labourer. 1919 – Alfred dies at home. There is a discrepency with his age. The newspaper clipping says he dies in his 70th year which makes his birth date 1849, but in the 1851 census his age is 10, which makes him born in 1841.
where his final resting place is, although we were unable to find it. It is always so satisfying being able to complete an ancestors timeline.